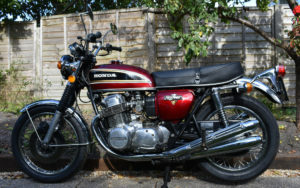 Here is a photo of a beautifully restored Honda CB750 K6 that has just been added to the gallery. The bike is finished in Candy Antar Red and is powered by a 736cc, transverse, straight-four engine with a single overhead camshaft (SOHC), linked to a five speed transmission and a chain drive. It was fitted with a 16” rear wheel but now looks far more handsome with an 18” assembly supplied by Wheelwise Engineering. Two more bikes for the Gallery! 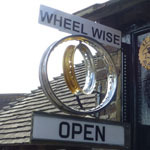 Copyright © 2014-2018 Wheelwise Engineering. All rights reserved.